The application for faculty who are interested in joining GWUs Faculty in Residence and Faculty Guide programs is open until February 15th. 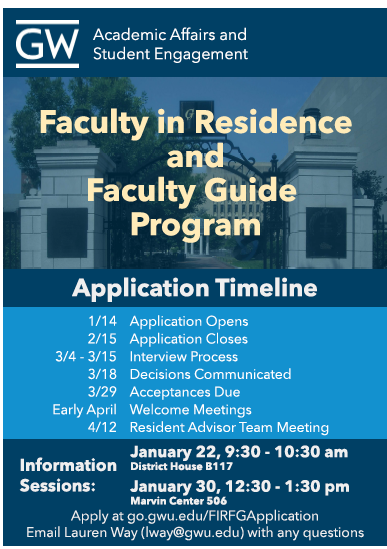 The Faculty in Residence and Faculty Guide program is a partnership between Academic Affairs and Student Engagement, that provides faculty members with the unique opportunity to connect with students in a residential setting. Faculty connect with students through programs, events, and informal interactions, and collaborate with residential staff in supporting our communities. This a a great opportunity for faculty whose scholarship would benefit from living and learning in community settings on campus.